Are you trying to tackle the problem of getting into and out of your bathtub more easily & safely? Product designers have devised a wide variety of creative equipment solutions to help you do just that. This article presents an overview of the different categories of bathtub transfer equipment solutions available. For each category we have identified some of the key pros and cons to aid you in better determining which type of bathtub solution will work best for your needs. The solutions found below all have one key thing in common – they can assist you to eliminate the most difficult and dangerous part, which is ‘stepping over the bathtub wall’. 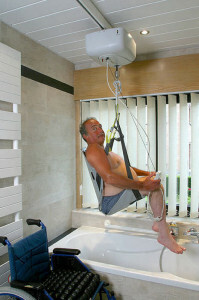 The solutions differ in regards to whether they will simply allow you to transfer into the bathtub to perform a seated shower (e.g., shower chair, shower bench) or whether they will help you to also get down and up from the bottom of the bathtub for a hot bath (e.g., bath lift chair, wall lift, ceiling lift). They further vary in whether they are designed to be used by you independently or whether they require you to have the assist of a second person. 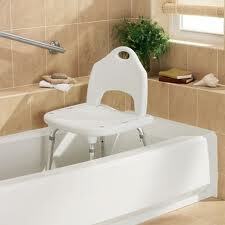 Some bath chair’s are specially designed with a seat portion that slides, swivels or does both. The chair can be turned to face the outside of the tub, allowing you to sit down on it as if you were sitting on a regular chair. 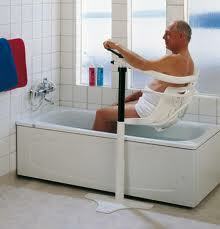 The seat assists you in sliding yourself backwards into the bathtub and turning to face the shower head. 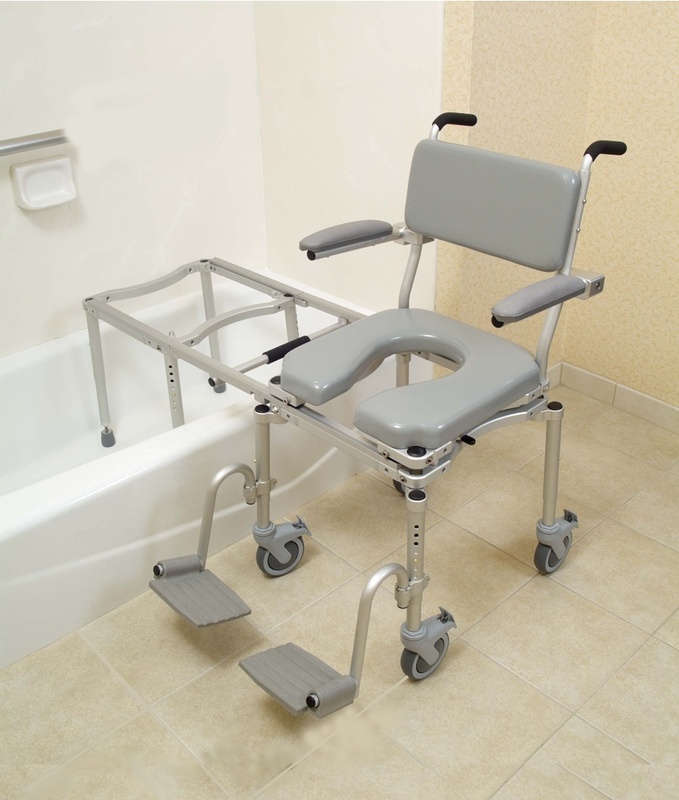 Models that clip to the tub wall are more stable and less like to tip than a free-standing bath chair model when you are transferring on and off of the seat. The chair is fully contained within the confines of the tub, so it will not impede your ability to move and turn around inside the bathroom if you use a walker or wheelchair. Models with a seat that rests at the height of the bathtub walls are likely to be too low for someone who is tall to easily sit down on and stand up from. Bath seats that clip to or rest on the tub wall will make it more difficult to tuck the shower curtain inside the tub. 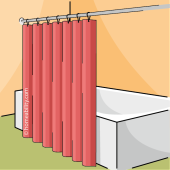 Visit our shower curtain guide for ways to adapt the shower curtain. More: To learn more about what features to consider when selecting a sliding swivel bath chair and to see examples, visit our sliding swivel bath seat guide. The swivel bathtub bench is similar in many respects to the swivel bathtub chair that rest on the tub wall, but it has three distinct differences: it is free standing, it has a height adjustable seat, and it has legs that sit on the floor outside the tub. The seat height is adjustable, making it a better option for taller individuals than bath seats that rest on the tub walls. More difficult to tuck the shower curtain inside the tub. 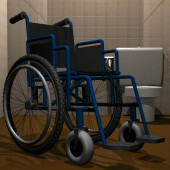 The legs positioned outside the bathtub can get in the way if you use a walker or wheelchair to move and turn around inside the bathroom. Note: Bath benches generally work best in tubs with a square-ish shaped bottom. Be aware, if your tub’s walls curve inwards significantly at the bottom edges, then the two interior bath bench feet (which will rest where the floor becomes flat) will be forced to sit further towards the center of the tub, consequently forcing the center of the bath seat out over the bathtub wall. 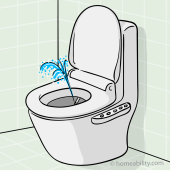 This could result in you sitting with one leg inside and one leg outside the tub. More: To learn more about what features to consider when selecting a sliding swivel bath bench and see examples, visit our sliding swivel bath seat guide. Battery operated bath lifts are specially designed to lower you down to the bottom of the bathtub for a hot bath and raise you back up again when your bath is complete. Pros: No installation required. Minimal assembly may be required. The bath lift seat will still be underneath you when you are seated at the bottom of the tub, which means you will be suspended a few inches above the tub floor, thereby resulting in a little less of your torso being fully submerged under the water. The bathing solution is typically not ideal if you are a taller individual because the bath lift does not sit flush with the back wall of the bathtub so you will lose valuable space to accommodate the length of your legs. The lift is not firmly fixed to the tub or bathroom wall, so it may wiggle a little when you sit down or stand up from the seat. Most models have suction cup feet, which will help to secure the lift in place if the tub floor is smooth. Batteries will need to be recharged and replaced. More: To see examples and learn more about what features to consider when selecting a bath chair lift, visit our Bath Chair Lift Guide. This battery-power style bath lift does all the lifting. At the push of a button an air-inflatable lift cushion deflates slowly lowering you to within a few centimeters of the bottom of the bathtub and with the push of a button re-inflates to raise you back up again. An air-inflatable bath lift will allow you to get closer to the bottom of the bathtub than a chair-style bath lift with legs that fold down underneath the seat (see previous option above), resulting in the ability to more fully submerge yourself in the water. It you have decreased balance skills, you may find sitting down and standing up from a soft, air-inflated surface to be difficult. If you are a taller individual and you experience difficulty standing from low surfaces, an air inflatable-style bath lift is probably not going to be an ideal solution for you because the maximum seat height is likely to be low for you to comfortably stand up from. This bath lift has a manual crank. You simply need to turn the crank and the seat lowers you down into the bath water and raises you back up again after the bath is complete. The crank handle can easily be removed from the lift while you are bathing. It does not require batteries so you don’t need to worry about charging it or replacing the batteries. It does not take much strength, but it does require some endurance to crank it down and then back up again. This bath lift seat does not have side flaps to help make the transfer between the bathtub wall and the chair seat safer and easier. (For reference see the picture of the previous bath lift). The lift’s legs fold down below the seat when you lower to the bottom, which means you’ll still be suspended several inches above the bathtub’s floor. A transfer bench is equipped with a seat that is long enough to extend over the bathtub wall, making it possible for you to sit down on the bath seat first, prior to entering the tub. From a safe, seated position you can then lift one leg at a time over the bathtub wall and scoot your bottom sideways across the bench top until you arrive in the center of the tub. The bench legs resting on the floor outside the tub can make it more difficult for a person using a walker or wheelchair to move and turn around inside a small bathroom. More: To learn more about what features to consider when selecting a bath bench and to see examples, visit our bath bench guide. Bathtub chairs have a smaller seat than a bathtub bench and all of the legs reside inside the tub. Some (but not all) bath chair models have a wide enough seat to allow you to sit down on the side of the seat, prior to entering the tub. Once seated safely, you can lift one leg at a time over the bathtub wall and turn your hips to face the shower head. The seat is fully contained within the confines of the tub, so it will not impede your ability to move around inside the bathroom if you use a walker or wheelchair. It requires more balance skills to lean backwards over the tub wall and sit on a chair that is positioned inside the tub, than to sit down on a bath bench with a seat that extends over the tub wall. More: To learn more about what features to consider when selecting a bath chair and see examples, visit our bath chair guide. Bath boards rest on top of the bathtub walls. Most bath board models are portable and come with rubber stoppers or suction cups attached below the board to prevent the board from sliding when you sit down. Some models are designed to be screwed to the wall, making them more secure and less likely to move or wiggle when you sit down and stand up. Portable-style do not require installation. It is fully contained inside the tub, so it will not impede your ability to turn around if you use a walker or wheelchair in the bathroom. Makes it more difficult to tuck the shower curtain inside the bathtub. The portable-style models may tip forward as you lean down to wash feet or legs. This rests at the height of the tub wall, which tends to be too low for tall individuals to easily sit down on or stand up from. Note: Confirm that you have enough of an exposed ledge present on top of each of the bathtub walls to safely accomodate the board. Models will differ in the width of the ledge required. More Info: To see examples and learn more about what features to consider when selecting a bath board, visit our bath board guide. One side of this bath seat rests on the bathtub wall and the other rests on two legs, which extend down to the bathtub floor. You can sit down on the side of the seat prior to entering the tub. Once seated, lift each leg over the tub wall and turn yourself to face the shower head. Pros: The clamps help hold the bath bench in place so it isn’t likely to move or wiggle when you sit down on it. The seat rests at or near the height of the tub wall. If you are tall this height could be difficult to easily sit down on and stand up from. Makes it more difficult to tuck the shower curtain inside. More Info: To see examples and learn more about what features to consider when selecting a bath board seat, visit our bath board guide. This bath chair is equipped with an extra attachment on the side of the chair that rests on the bathtub wall, making it possible for you to sit down on the seat, prior to entering the tub. Once safely seated, lift your legs one at a time over the tub wall and scoot yourself across the seat and into the center of the tub. The tub wall provides added support to stabilize the seat, making it less likely to tip or wiggle when you sit down and stand up. The chair portion can easily be detached from the track and functions like a wheelchair, making it possible for a caregiver to transport you safely into and out of the bathroom. Once inside the bathroom, the chair is re-connected to the track. Then the seat part (and you) can be easily slid across the track, over the tub wall, and safely into and out of the bathtub. This bath transfer system makes it much easier and safer for both you and your caregiver by successfully eliminating two of the most dangerous transfers – namely stepping into and out of the bathtub. The transport chair is narrower than most wheelchairs, so it can often fit through a narrow bathroom doorway where your wheelchair may not. 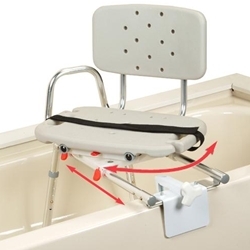 Most of the bathtub transfer systems on the market have a cut out portion in the center of the seat, which allows the chair to dual as both a shower chair and a toilet transfer chair. Cons: It will not work in all bathroom configurations. There must be enough space to turn the chair sideways and for the person seated sideways to be able to lift their legs over the tub wall. Note: The upfront cost of this type of bathtub solution may seem like a lot at first sight. However, if you plan to use the equipment for several years, it can result in money saving in the years ahead by helping to prevent the need to perform an expensive bathroom remodel and by making it possible for a family member to single-handedly assist with the transfer in and out of the tub, thereby reducing the need to hire a pay a caregiver to assist. At the push of a button, a battery operated belt assists to lower you to the bottom of the bathtub and back up again. The belt is not a solid, stable surface to sit on. This product is not recommended if you have poor balance skills or poor upper body strength. This type of solution is typically not ideal if you are tall because it rests at the height of the bathtub walls, which is too low for most tall people to easily sit down on and stand up from. It does not have a back to lean against, so if you were to lose your balance as it lowers you down there is a potential you could fall backwards and knock your head against the wall. It requires installation, which adds additional cost. A water powered bath lift attaches to your bathtub or shower fixtures and the water pressure acts to raise and lower the chair. Your water pressure needs to be able to achieve a minimum of 20-30psi for the lift to function. Some models (not all) offer a swivel seat that allows you to sit down while your legs are outside the bathtub and then swivel into the bathtub, eliminating the need to step over the tub wall. It sits on the flat, bottom part of the bathtub. If your bathtub curves inwards at the bottom, the lift will sit forwards from the back wall, meaning you will have less space in front of you to stretch out your legs when it has lowered you down. In most cases it requires a second person’s assistance to swing the device into and out of the bathtub, though some individuals may be able to swivel themselves from a wheelchair into the bathtub independently. This style of lift assists you over the edge of the bathtub and also to the bottom of the bathtub and back up again. This style of lift can assist you from a wheelchair over into the bathtub, as well as down to the bottom and back up again. The track is installed on the ceiling so the equipment does not impede mobility in the bathroom. The sling portion can be removed when not in use. OK. So you arrived at this page wondering if there was one solution to help you get into and out of your bathtub more easily – and now you are seeing that there is not just one or two possibilities, but there are in fact a dizzying number of possibilities. Once you have determined the general type of solution you feel will work best for you (bath chair, bench, wall lift, floor lift, ceiling lift etc.) then it will be necessary to narrow it down further to which manufacturer, make and model you like within the given categories. In future articles we will be exploring each of these categories in more detail, including the specific models and manufacturers. To stay up to date as new articles are added, sign up for the Homeability Newsletter. Also feel free to post a comment or question to this article (scroll down to comments). Perhaps you are someone who is able to use a bath transfer bench to slide yourself over the tub wall, but still find that you experience some difficulty lifting your legs up one at a time over the wall. If this is the case, a simple gadget called a “Leg Lifter” can be used in conjunction with a bath transfer bench to make getting in and out of the tub easier. It has a loop, allowing you to catch hold of your foot. Once your foot is positioned in the loop, the lifter can make it easier to move your leg up and over the tub wall. Looking for options that work with clawfoot bathtubs. Any ideas? There are not many options, but there are some. We have an article dedicated specifically to this topic that summarizes the different options ranging from bath boards to bath benches for clawfoot tubs. Inside of the article, you’ll also find links to additional articles that go into more depth on each of the options. 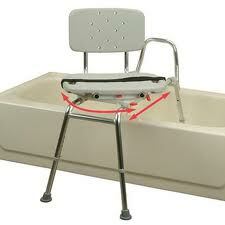 Visit: Bath Bench for Clawfoot Tubs: The Best Options. Very good, informative article. My question is regarding the type of shower curtain to use when a ceiling lift is installed. The usual curtain bar would interfere with the rail on the ceiling. Any suggestions? Thanks for any help! Hello! We are happy to learn you found the information beneficial. There are not many options for shower curtains that pair well with ceiling lifts. A shower curtain attached to a swing away shower rod is one possible option. See our guide: Shower Curtain for Accessible Tubs & Showers for examples. With a swing-away, pivoting shower rod you’ll need to be careful to keep the water from directly hitting the curtain. If you do opt for a pivoting shower rod, you can consider installing a hook on the opposite wall with a long loop of material/rope attached that you can use to wrap around the end of the end of the shower rod (after you are inside) to help hold the rod in place and prevent the curtain from blowing open. (For the loop part, imagine something like a standard household curtain “tie back” being installed on the wall opposite from the pivoting shower curtain arm.) I hope this helps! Hello! I’m not aware of a 2 legged bath lift. There are stationary 2-legged benches that rest on or clamp to the tub wall that can be folded up & stored by the tub when not in use, but they do not lift a person up/down. Without having seen it, my first assumption is that if there is a bath “lift” with only two legs that it will be much less stable and more likely to tip or wiggle when a person is getting on/off than the 4 legged-style bath lifts. One option she may want to consider is an air inflatable bath lift. The air-inflatable bath lifts currently achieve the lowest seat height of any of the portable-style bath lifts. They will also allow her to lie fully reclined against the back of the tub making fully use of the length of the tub. 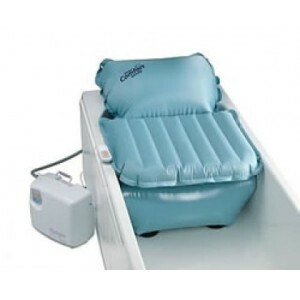 The pros and cons of the air inflatable bath lifts are discussed in the article Getting In & Out of the Bathtub: Benches, Lifts, and Transfer Chairs. We hope this helps! sale? I’m in Coral Springs FL. Hello! 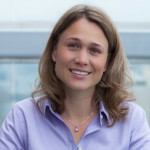 Homeability.com is an informational resource only. Homeability does not sell any of the equipment that is shown. Our guide on Home Modification Funding has a section covering some examples of websites that list recycled medical equipment for sale. Another option to try is to search for the words “recycled medical equipment” and the name of your city to see if there are any local providers for used equipment that may have one available. We hope this helps! Thank you very much for your kind words and for taking the time to share your experience. We are very happy to learn the information was beneficial. Homeability is a free, informational resource only. We do not sell any products. We do have a guide that provides a summary of the different types of grab bars that are available. See Grab Bars: Which Type is Best? In that guide, you’ll see some different examples of the suction-cup style grab bars. We hope this helps! Hello Eva. Thank you for your comment. Some trapeze-style support bars do exist, but you would need a considerable amount of arm strength to pull yourself up from the bottom of the tub using a rope or trapeze. You may want to instead consider adding one or more grab bars on the walls around the tub to assist with pulling yourself up. In particular, the wall-mounted Swing Out style grab bars would be a good consideration because they provide different height handholds, allowing you to progressively pull yourself up as if using a ladder. This article shows both the swing-away style support rails and trapeze-bars, as well as many others. See: Grab Bars: Which Type is Best? If getting up and down becomes more difficult, you may want to consider one of the bath lifts that can help to lower you down and raise you back up again. See: Bath Lift Guide: The Basics. As a back up in case of an emergency, it is always wise to have a portable phone within reaching distance of the tub in case you ever find yourself in need of additional help. We hope this helps! Great article! What a great resource this website is! 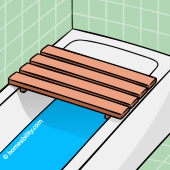 I have problems locating a lift chair / bench that raises a users legs over the tub sides and into the tub. I am trying desperately to find this option whether for a bench / chair to get over into the tub for showering or submerging for bathing. Something with leg rests that “ratchet up” would be optimal. Needing options that are more suitable than benches that require someone to lift and turn a user’s legs after sliding onto the bench. Are there any options for people who have limited to no mobility for their legs from the knees to feet and who are also spastic? The only options that I’ve found thus far are those systems with over head lifting arms and body slings, etc., and some similar systems that are extremely expensive. Both which raise the entire body. Any recommendations would help. 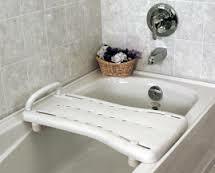 I have not seen any portable chair-like bath benches that have leg rests that ratchet up. There are special bathtubs that have a powered bath chair that swivels into the tub with powered leg rests, but this requires purchasing a new bathtub and then paying someone to remove your old tub and install the new one. This would not be cheaper than the ceiling lift or wall mounted lift that you were mentioning. There is an option that doesn’t require installation on the wall or ceiling. If you are able to transfer onto a bed independently, the Aquatec Major Full Length Bath Lift may be a consideration. It unfortunately wouldn’t be classified as an inexpensive solution. The cheapest option that may work for you would be to purchase a leg lifter to assist you in lifting one leg over the tub at a time. Simply type “leg lifter” into your search box and you’ll see there are dozens of companies who offer these – usually for under $20. The models that have aluminum in the shaft and in the loop part that slips over the foot (versus a model with a fabric loop) may make it easier for you to catch your foot with the device. Good luck! If you stumble upon a better solution. Please come back and share it so more people will benefit. I have a shower chair with adjustable legs. My shower floor is not flat. The adjustable legs keep going up, lowering the chair. Is there a way to keep them in place. I thought maybe I could tape them with duck tape. Would that work? Is there something that would work? Hello. It sounds from your comment like the shower chair’s feet are sliding up and down the angled shower floor surface, that is in turn causing the chair to tip forward. 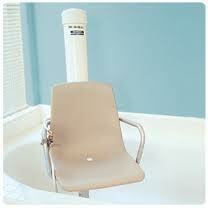 You might consider purchasing a bath chair with heavy-duty suction cup feet, which may help. Some companies sell replacement legs that include suction cups, so you could also try calling the manufacturer of the chair you have to see if you can replace just the bottom part of your chair’s legs. 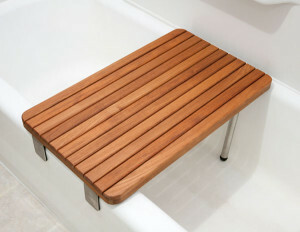 Or, you could consider purchasing one of the bath “benches” with 2 legs that extend out over the shower wall. This way two legs would rest flat on the floor outside and the other two could be placed on a flatter part inside your shower stall. Bath benches with screw-style feet work best because they allow more fine tuned adjustments for differences in floor heights. If you have glass shower doors, they would need to be removed and replaced with a curtain and shower rod for this solution to work. If you stay with what you, have then certainly anything you can do make it more stable and therefore safer would be good. Having never used duct tape in a shower I can’t speak to how it would do, but it seems like it would be worth a try. 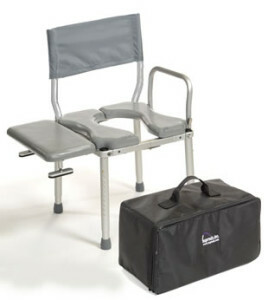 I am going to have a total hip replacement what kind of chair would be high enough to get into the bath tub without raising my leg too high ( cannot not do a 90 degree lift). Thank you for any information. 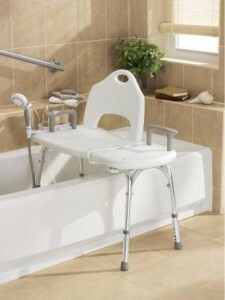 Most bath chairs come with adjustable height legs that allow the seat to be raised up to a height of around 23″ tall. If you are on the taller side, confirm the seat’s maximum achievable height with the manufacturer prior to ordering, to ensure it will reach the height you need. Take the measurement from the back of your knee to the floor. This will be the absolute minimum height your bath seat should be to maintain 90 degrees. Ideally set the seat height to be a few inches higher than this so it will be both easier to stand up from and sit down on and will make it easier to lift your leg over the tub wall while maintaining your hip precautions. Bath chairs with a back are typically preferred to back-less styles and those that have a screw-style leg (i.e. Carex bath chairs) will make it easier to finely adjust the height of each leg so the bench will sit more stably on the curved bathtub floor. Bath chairs can be purchased at many local medical supply stores or online. This site is provided for informational purposes only. We do not sell or endorse any specific products. We recommend that you check with your therapist for further recommendations. you have really set out the shortcomings of walk-in tubs terrifically! Thanks for all the great info on alternatives to them. Your site is wonderfully informative! Thanks again! There are several Sliding-Swivel Bathtub Chairs displayed on this website. I have a question about these sliding-swivel models. Can they be ordered or adjusted for the chair to face the front or back of the tub? This is an informational blog to help people better understand what is out there. We don’t sell the products listed here, but there are a number of different sliding tub transfer benches out there. Most can be ordered so they can face either direction. In some cases the handles and/or back rest can be reversed after purchase, in other cases you must specify ahead of time which side you want the handle on prior to ordering. I’d like to point out that you missed the wobbliness of legs-inside-tub shower chairs that makes so many detest it. When shower chairs are not of the proper size for tubs, the legs rest on the curved bottoms and cause wobbliness that can often scare people and make them resistant to using it. Absolutely amazing website. Very helpful information.